In the PBS documentary The Ape Who Went to College (which fails as a potentially tantalizing glimpse into a simian’s hard-partying frat pledge) the orangutan Chantek is raised as a human child. He is taught sign language, masters hundreds of signs, is taken out for ice cream and begins copping a hubristic human attitude toward his fellow orangutans. In the 1986 feature Link, tag-lined “an experiment in fear” we see that the experiment has shown very little demonstrable effects of fear and that perhaps the lab should have its funding yanked. Still, monkeys, mayhem, mammaries oh my! The plot is laconically described on IMDb: “A zoology student must try to out smart a murderous and super-intelligent orangutan.” (the titular character) The smart money would be on the orangutan. The reviewer plainly observes what a seasoned primatologist grad student played by Elisabeth Shue can’t: Link is an orangutan and not a chimp! 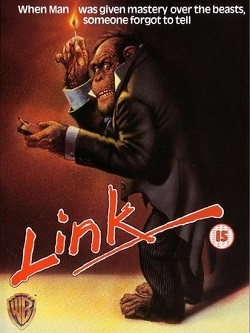 You see, Link is a movie about chimps and they’re even referred to as such but the eponymous character is portrayed by Locke, an orangutan that was actually given a bad dye-job and passed off as a chimp (!). We don’t know if this was Locke’s idea, but if he was named after an English empiricist, it might have been. An interesting side-note: Link/Locke’s trainer was the same guy who gave acting lessons to the birds in Hitchcock’s Birds (and Hitch had the good sense not to pass off crows as common grackles or whatever). Anyway, Locke makes a monkey out of all of us and out of Terence Stamp who plays a researcher who studies human and “chimp” interaction in England. Shue is the American student, two years removed from The Karate Kid who takes on a job as his research assistant despite dire warnings that an ape beast ripped a previous owner to pieces (this had to narrow the field of research applicants). Anyway, the plot of many horror films hinges on people not taking advice: don’t go in the basement, don’t explore the old farm house, don’t play with that vial of green liquid…to which we can add: don’t engage in weird anthropological studies with probable recidivists. The lab chimps led by Link get antsy and become savage beasts, which is never good. The cigar-smoking Link survives a few shot-gun blasts and even ogles a naked Shue in the bathtub – bonus. 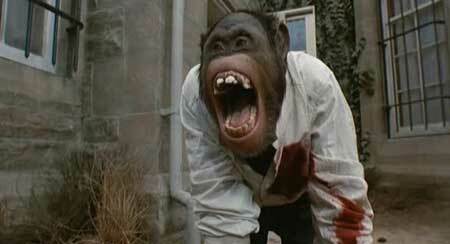 This entry was posted in Horror and tagged 80s horror movies, natural horror by Really Awful Movies. Bookmark the permalink.